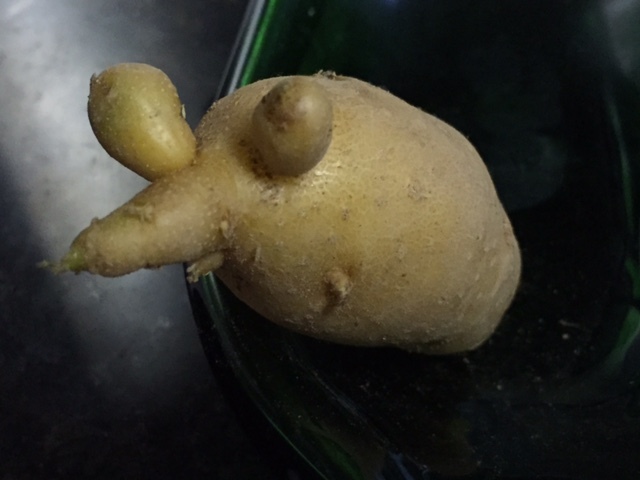 I first learned potatoes have eyes when, as a child, my paternal grandfather taught me to wield a sharp knife and carefully cut seed potatoes into pieces for planting. Paw Hamby showed me how to recognize the small spots where sprouts form and how to slice around those places, leaving enough potato flesh to provide nourishment for the developing plants. Along with other gardening lessons I didn’t realize, at the time, I internalized, how to prepare seed potatoes is a skill I am thankful I learned. As I inspect the annual late-winter delivery to my home, I can hear Paw Hamby’s voice, offering advice to maximize the harvest. When I grew my first large crop of organic potatoes, several years ago, I was lucky to have a daughter, home from college for summer break, as my farm helper. Since we did not own a plow at that time, we used shovels to turn tubers from the ground, taking care not to cut them as we repeatedly plunged the tools into dry, hard soil. 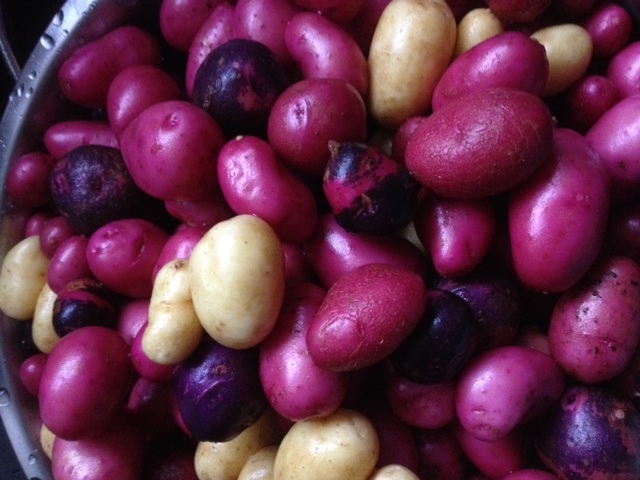 Backbreaking work, to be sure, but our rewards were buckets full of potatoes, ranging in size from tiny fingerlings to large baking and sporting beautifully colored purple, pink, gold and red skins. We sold our wares at local farmer’s markets that summer and to Blowing Rock and Boone, NC, chefs. Without Kate’s help, it would have been impossible to work the farm, harvest, prepare produce for market and then set up sales booths twice each week, plus make special deliveries. No wonder she took an internship job in the city the following summer! When I was a child, my family gardened and we grew a lot of the food we consumed. We and others in our rural community planted potatoes early in the spring and harvested during summer. Locally, folks referred to the tubers we grew as “Irish,” to distinguish them from sweet potatoes. Kennebecs and Red Pontiacs were the usual suspects; Yukon Golds came on the scene years later and were not widely cultivated in our area. Kate and I were the first to offer fingerling potatoes at the Blowing Rock farmer’s market and they were an instant hit. A large board advertised our weekly offerings and displayed farm photos. 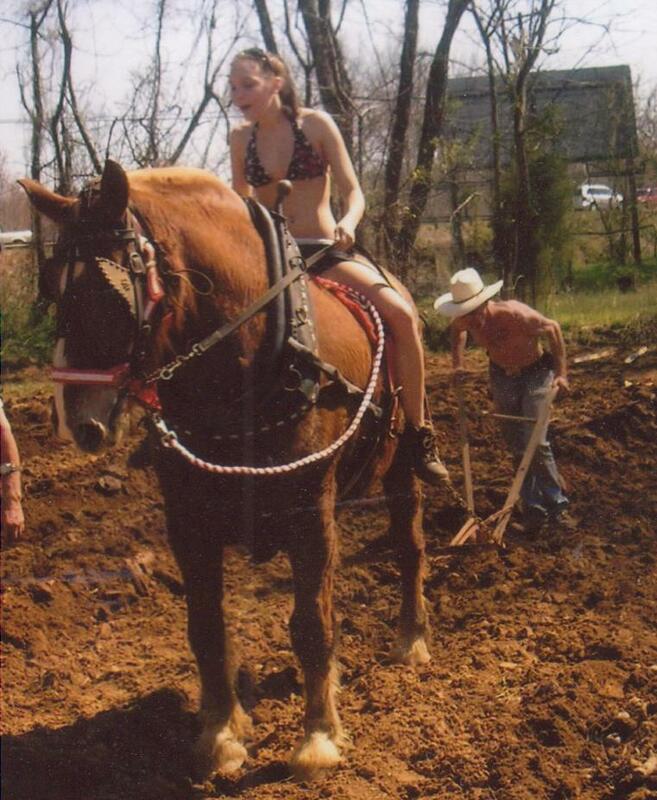 People often stopped to look at a photo of bikini-clad Kate, astride a friend’s huge Belgium, guiding the horse as he pulled a plow to plant potatoes. Although the photos were great conversation starters, potatoes, freshly harvested, brought us many repeat customers. Once, a young woman rushed to our booth and said her mother, unable to visit that day’s market, asked her to buy potatoes from “The Potato Lady.” Another day, a customer forgot her umbrella and Kate placed it beside our table for safekeeping. Later, we saw the woman returning and Kate waved the umbrella. Relieved to see it, the woman said, “Oh, thank you! I thought I left it at The Potato Lady’s booth!” Kate and I joked that I was now “The Potato Lady.” I did not mind the moniker; after all, there are worse titles! Richard and I made this potato salad recipe with some of our first-of-the-season harvest and if you like a side dish that is hearty enough for a main one, try this. Gently cook potatoes in salted water until fork tender. Do not overcook! Drain potatoes, place in a large bowl and sprinkle with 2 tablespoons herbed vinegar or red wine vinegar. Use hands to combine. Add the following and stir all ingredients to thoroughly combine: 1/4 cup bottled Italian salad dressing, 2 tablespoons mayonaise, 1 tablespoon Dijon mustard, 2 tablespoons capers, drained, 1/4 cup chopped radishes, 1/4 cup chopped celery, 2 hard-boiled eggs, chopped, 1 tablespoon dill pickle relish, 2 tablespoons red onion, diced, 1 teaspoon fresh dill, snipped, 1 teaspoon fresh chives, snipped and 1 teaspoon fresh thyme leaves. 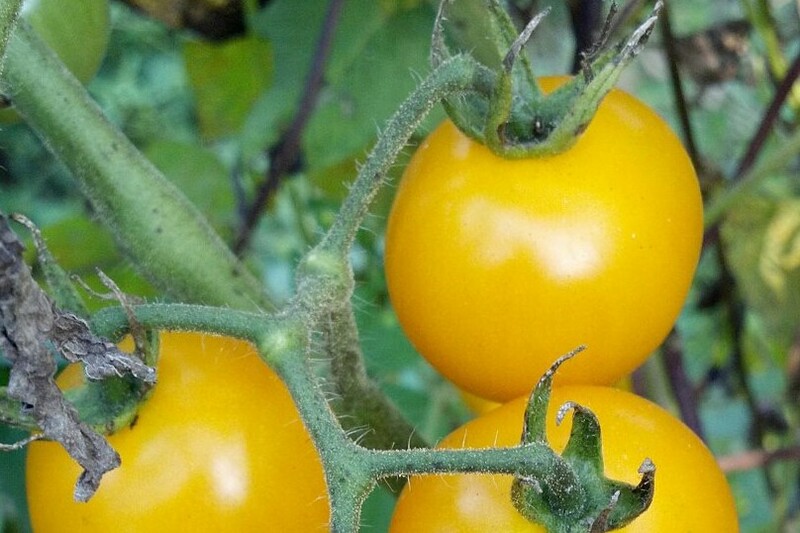 This entry was posted in Heirloom Seeds on July 27, 2015 by cindybarlowe.